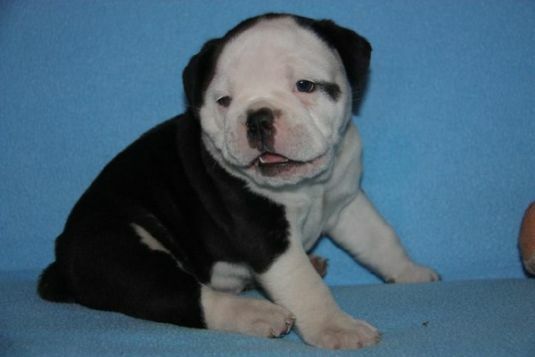 Kadin is an exceptional Olde English Bulldog puppy that we produced. He has awesome color, and head and body mass. He loves to play, but is more of a “Lover” than a “Fighter". He loves to cuddle and sit on your lap while his brothers and sister attack your feet! He is going home with Josh and Michelle soon! Our bulldog, Clark W. Griswold is alsomt 3 yrs. He actually carries his sled back up the hill by himself so he can sled back down again.I have a picture but I am not very computer literate so I don't know how to show it to you. Plus we live in the middle of nowhere so the only internet connection choice we have is very sloooooow satellite. I guess if you would like to see it you can email me at and I could send it to you.I hope your Clark brings as much wonder and amazement to your lives as our Griswold has to ours!